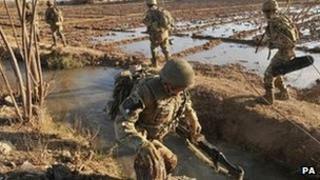 A British soldier has been killed by enemy fire while on patrol in Afghanistan, the Ministry of Defence (MoD) has said. The soldier from 14th Signal Regiment (Electronic Warfare) had been on patrol in Helmand Province when he was killed. A spokesman said the soldier was "the brightest and the best" who had "died defending his comrades". His death brings the number of UK service personnel who have died in Afghanistan since 2001 to 445. The serviceman's next of kin have been informed. He died at the scene, despite receiving "immediate medical attention" after coming under enemy fire in the area of Kakaran, north east of the provincial capital Lashkar Gah, the MoD said. Spokesman for Task Force Helmand Lt Col Hywel Lewis said: "A fantastic soldier has tragically died defending his comrades. He was the brightest and the best. The soldier is the seventh British serviceman killed in Afghanistan this year and the first since 30 April, when three soldiers from the Royal Regiment of Scotland were killed after their armoured vehicle hit a roadside bomb. According to the Army's website, the role of the 14th Signal Regiment (Electronic Warfare) - who are based at Cawdor Barracks in Pembrokeshire - includes attacking targets by jamming electronic systems and preventing them from working properly. British troops are due to leave Afghanistan by the end of 2014, when all Nato combat operations are scheduled to finish, although a small number will remain in support roles. The number of British troops in Afghanistan was reduced to 9,000 before the end of 2012 and is set to fall to 5,200 by the end of 2013. British troops are now placed at five bases - down from a peak of more than 130 - and rarely go on patrol. Last week, the 7th Armoured Brigade, the Desert Rats, became the last major British force deployed to Helmand.